Grouper is a saltwater fish, it has become very popular in the United States being caught in the Atlantic and Pacific Ocean and a big catch in the Gulf of Mexico. They can range from 10lbs up to 100lbs and if you've caught even a small one, you've had a good day fishing! The biggest recorded was 552 pounds - that's a lot of portions of fish. It's a firm white fleshed fish - quite delicate in flavour. 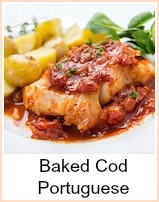 It's suitable for most types of cooking - so substitute it for cod, haddock, whiting and similar. 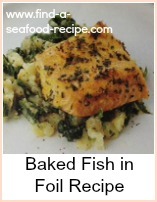 There are three recipes linked at the bottom here which would be very good using grouper. Oil a shallow baking dish and put the onion in, half the courgettes and then the fish. Season with pepper, a little lemon juice, half the basil and then put the rest of the courgettes and the tomatoes on top. Season again with pepper, the rest of the lemon juice and herbs and add the wine and 1 tbspn of oil. Mix together the cheese and breadcrumbs and pile it on top - drizzle olive oil over. 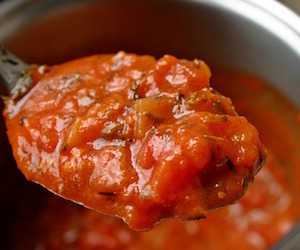 Here's the second of my grouper fish recipes for you - a lovely tomato and olive sauce - serve it with fresh crusty bread to mop up all the juices. Heat half the oil in a frying pan and gently cook the garlic, onions and pepper until softened. Put into an ovenproof dish. Heat the rest of the oil and quickly fry off the grouper chunks - just enough to seal them, so that they don't disintegrate in the sauce. Transfer the fish to your baking dish. Put the tomatoes in the frying pan and bring to the boil - make sure you scrape off all the residue from the pan - then pour the tomatoes into the baking dish. Add the rest of the ingredients - a few twists of black pepper and stir everything together thoroughly. Cover and bake in the oven for about 20 minutes until the fish is cooked. Just before serving, gently stir in the yoghurt, cream or creme fraiche. As always, you can substitute other fish fillets in these grouper fish recipes - your choice. Grouper Fish is a firm white fish with a delicate flavour. 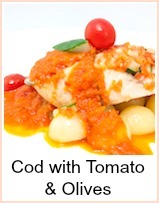 These recipes are for braised and baked grouper but you could substitute it for cod or other white fish in any recipe.